To build a brand or fine-tune the brand you have, you first need to know where you want to arrive. Which of the following brand functions best describe what you aim to achieve through branding? Some brand builders, especially those representing big, hugely funded companies or top-tier celebrities, aim above all else to establish and entrench top-of-mind awareness to ensure that the spotlight in their category shines brightly and fully in their brand’s direction. Others want to forge emotional connections with customers, to differentiate their products from competing offers, or to develop the kind of preference and motivation that prompts purchase decisions. Some brand builders want their brands to do all of the above. 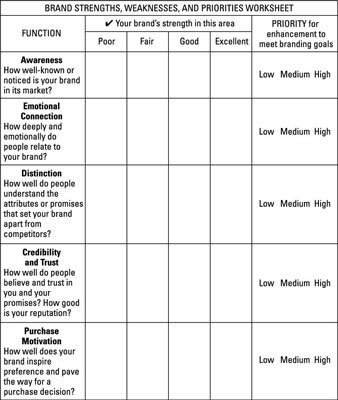 Use this worksheet as you set your branding goals. Awareness leads to marketplace dominance. The most powerful brands owned by the biggest companies and celebrities hold their competitive positions based largely on how widely they’re known and noticed. Awareness makes selling easier. Marketers who aren’t branded with names like Nike or Beyoncé still need to build awareness, not to become the best-known brands in their marketing worlds but to build sales, pure and simple. Not all brands rely on emotional connections. Some brands succeed based on their high levels of credibility or on their abilities to distinguish themselves based on unique benefits that customers can’t get from competing companies. They appeal to what people think. Brands that rely on emotional connections appeal to what people feel; they involve decisions of the heart. Consider the last time you bought dish soap. You looked at the array of bottles, glanced at the prices, saw that a soap brand you’d heard of was competitively priced, and made your selection. You weren’t looking for a happy marriage between you and the dish soap — you just wanted to know you were choosing a good product for a decent price. On the other hand, think of what you went through the last time you bought a car; gave to a charity; helped your son or daughter select a university to attend; or decided on a new home. Suddenly, your emotions came into play. In addition to function, you weighed whether or not your choice would feel good — whether it would instill confidence, pride, or even a coolness factor. Your product is selected for the sense of satisfaction or security it delivers, the self-image it enhances, or the experience it provides. Your product involves a major financial investment or contributes to the customer’s ego or lifestyle. Customer loyalty is essential to your success. Face it, people stick with brands they love. If you’re not 100 percent sure of how you stand apart from the competitive pack, then product differentiation needs to move up on the list of what you want to accomplish through your branding strategy. Customers fail to see your offering as unique and distinctly beneficial. Your market environment is crowded with similar offerings. To win sales in your competitive environment, you frequently revert to a reliance on low pricing or discounting strategies rather than high value. Often, you need to undertake at least some level of product or service modification to add meaningful and differentiating attributes and benefits. Additionally, you many need to update how your product is packaged and presented to magnify important distinctions. Brands essentially result from promises made and consistently kept. If your brand fails to appear credible or trustworthy, it fails altogether. Developing or enhancing trust needs to be a top priority if you’re introducing a new business or product, if you’re selling a service, if you’re selling online, or if you’re facing a credibility crisis because you’ve failed to deliver on brand promises or customer expectations. Do people believe we’re credible and trustworthy? Do we appear credible and trustworthy? What promise do we make to customers, and do we keep that promise without fail? What guarantee or assurance do we extend? What additional promises can we make to build higher levels of trust? Brands are like great advance teams that establish interest, appeal, confidence, preference, and purchase motivation in a customer’s mind before you or your product ever enters the arena. Think back to the social scene of your high school days. Which would you have preferred: a date with a person whose name you knew and regarded highly, to whom you were attracted, and with whom you felt trust and a sense of pride in the potential association; or a blind date who didn’t even come with an assurance from a good friend? The answer’s a no-brainer. Faced with a selection, you and nearly everyone else opt for the safe choice. And the safe choice is the one you’ve heard of, the one that makes you feel good, the one with uniquely positive attributes, and the one you can rely on. Together, the brand functions combine to create preference and to motivate selection and purchase, although all don’t play equally in all branding strategies. If you’re launching a brand, your initial emphasis will probably focus on developing awareness and differentiating your offering. If you’re refining or realigning an existing brand, you probably have established strength in at least some of the branding functions. Therefore your future branding strategy will direct your efforts toward gaining strength in areas of weakness.